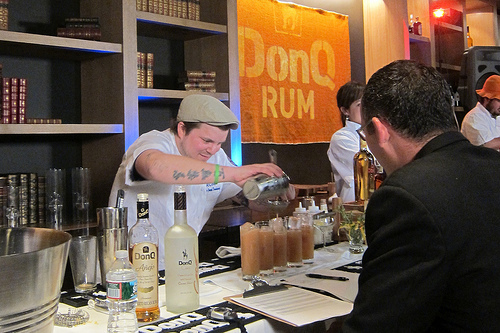 One of the cocktail competitions I was excited to see at the Manhattan Cocktail Classic was the Don Q Mix It Up competition. I had attended the LA Regional contest as a judge. What lurked under his bartender’s coat…sequins! 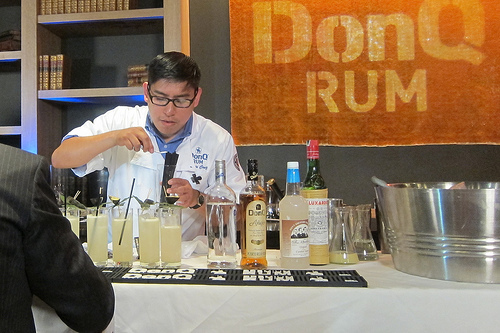 With competitors from USBG chapters from around the country, the competition lasted several hours as both technical and taste judges evaluated the Don Q cocktails. Five winners were announced including Dev Johnson in first place with his cocktail, The Jones Act. The hometown hero works at Employees Only in New York. 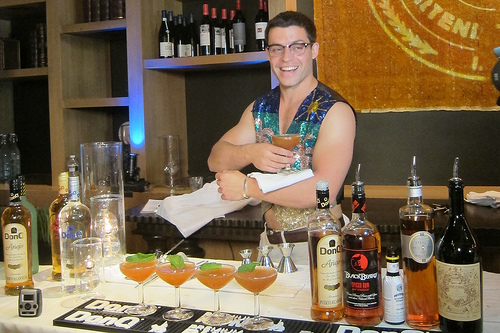 Taking second place was Julio Cabrera, one of Miami’s finest bartenders. J.R. Starkus from Las Vegas came in third place. And Sheridan Fay (Houston) and Nicole Tyler (Reno) came in fourth and fifth respectively. The five winners will receive a trip to Ponce, Puerto Rico to visit the Serralles Distillery where Don Q is made. They will also be featured in Don Q’s holiday videos. Pour the rose into a chilled cocktail glass. In a shaker tin, add rum, lime juice, liqueur, brown crème de cacao and ice, then shake. Strain into the cava filled cocktail glass. Garnish with the stem of the mint top pushed through the center of the lime wheel. This entry was posted in alcohol education, alcohol tasting, bar stories, bartenders, cocktail competition, cocktail week, cocktails, contest, events, hot bartenders, la, la cocktails, los angeles, spirits, the minty, travel and tagged bartender competition, bartenders, cocktail competition, cocktail week, contest, don q, don q rum, event, manhattan, manhattan cocktail classic, mcc, ny, nyc, rum, travel. Bookmark the permalink.